Brandon Sanderson is one of my favorite authors. He is a true master of epic fantasy, but is perhaps an even greater master of world building and refreshingly unique magic systems. The richly detailed worlds he creates are distinctly different from the “cut and dry” European fantasy tropes, and often have some distinctive environmental catastrophe going on. His magic systems, which are different for each world he creates, operate more like “powers” with clear and simple rules governing them, yet, at the same time, provide a brilliant catalyst for the movement of action and story development. Tor.com has a great article on Where to Start Reading Brandon Sanderson, to which I would naturally answer, “A nice comfy chair with a warm cup of tea at hand.” He is best known for his “Mistborn” series, which now numbers seven books with another book forthcoming, and for finishing the last three books of the “The Wheel of Time” saga following the death of Robert Jordan. For me, I quite enjoyed the “Stormlight Archives,” and I’m eagerly awaiting the third book in the series, though it will probably be a few more years before it is out. 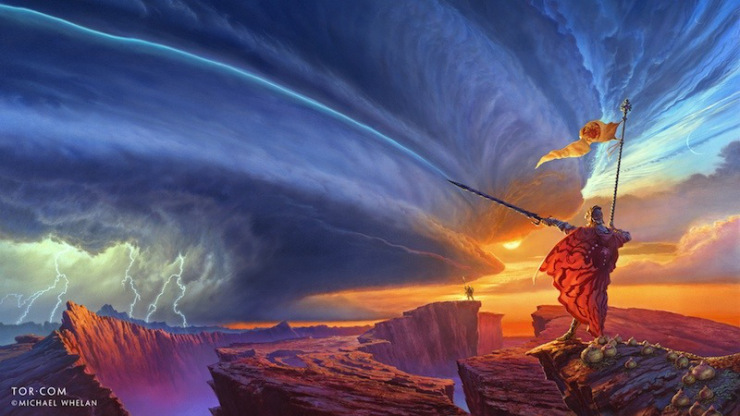 If you’ve never read anything by Brandon Sanderson before, I would encourage you to do so. If you’re tired of fantasy, I would still encourage you to give Brandon Sanderson’s works a try, as you will likely find his works refreshingly new and unique. If you’re more of an fan of hard science fiction, then I would ask you to consider what “hard fantasy” be like. And if you really want to know where to start reading, I would personally recommend starting with the “Mistborn” series, then move on to either the “Elantris” series or the “Stormlight Archives” series. So there you have it. Now grab a book, sit down, and enjoy!